Yellow, purple, white, red and orange flowers are in full blossom in my garden. The perfume from the flowers on the orange tree and grapefruit tree fill the air with a citrus fragrance. 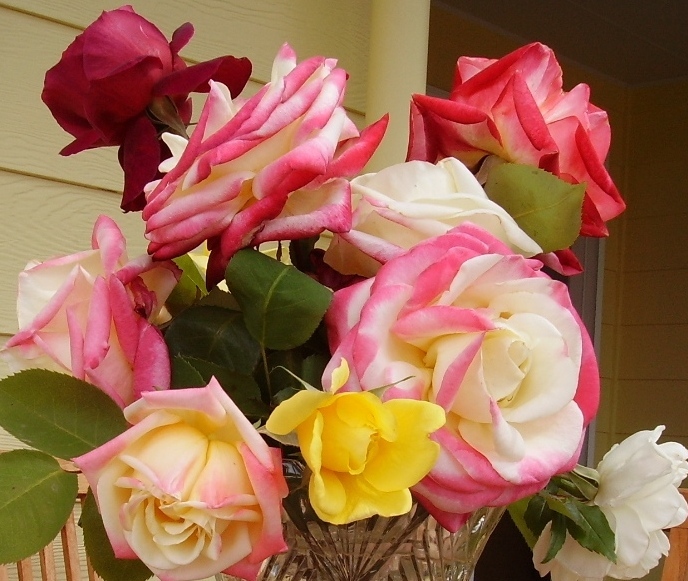 I have picked the first roses of the season and their perfume fills my kitchen. Since my recent change of direction I have not had a minute to spare. I have been totally occupied and feel fresh, rejuvenated and creative once again. I have so many ideas coming at me that it’s hard to keep up and to know which track to take. I have practiced playing the piano, designed a new website, been to the movies, eaten out with friends and family on several occasions, shopped, walked, cycled a 60 kilometre route through the nearby hills, cleaned the house and my study, enjoyed a lively discussion at Book Club, listened to music and practiced yoga. And this is just week one of my new life. I am also thinking about the next stage of my oil painting of tree ferns. I have been stuck after the initial laying on of paint, but now I feel free to attack the next stage. I have also worked in the local public library. What a great relief it is for me to once again be working in a positive, professional, and truly valued service to the community. To be able to help people find the information they seek and to see their immediate joy when we succeed in helping them. It is a pleasure and a privilege. One elderly lady wanted pictures and diagrams of Couta boats so that she could restore a model of a Couta boat that she had inherited. We have, in the collection, a fantastic book that answered her question specifically. This public library has Wii’s for the junior electronic games folk in our community. I have little experience with Wii’s, so after switching them on, I left it to the 6 year olds to work it out. And of course they did. One excited boy proudly told me he had reached Level 4! This entry was posted in Uncategorized and tagged Book Club, libraries, library, lifestyle, public, roses, work by suesbent. Bookmark the permalink.